KMS California. 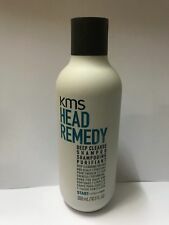 A deep cleansing shampoo for hair & scalp. Contains AHA structure complex to re-construct hair & even out hair surface. Leaves hair clean & healthy looking. A lush shampoo with UV filter that preserves fresh color, keeping hair vibrant. It is suitable for color-treated hair. As soon as we find out the status, we will let you know. Exclusively formulated for colored hair. As soon as we find out the status, we will let you know. Category Hair Care. Declaration Notices: on parcels cannot be declared at a lower value. All orders will be declared at cost price. For all hair types. Lather, rinse, and repeat if necessary. ‧ Leaves hair clean and healthy looking. AHA structure complex. ‧ Removes build up from hair products, minerals, pollutants and hard water. The TRIfinity technology ensures that you the best from the START. All KMS products are multi-compatible: they work together perfectly in the 3-step system and each step improved the style. The TRIfinity technology based on the developed system approach of KMS almost 20 years ago and ensures reliability, durability and high performance.